Our Freedman Chatlet is something which we tailor to our customers requirements each and every time. The original Freedman Chalet (pictured) was 10’ x 10′ overall including a 3′ decked veranda. Since then, every single one we have made has been different. Our customers like the ability to modify the design to their own exacting requirements. 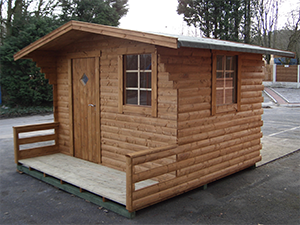 We can offer a range of options with regards to the layout and size of the building. 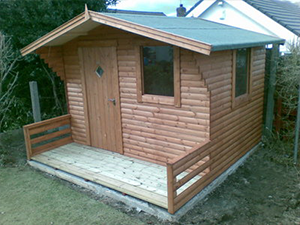 The same is true for the glazing on the Chalet as well as the decking. 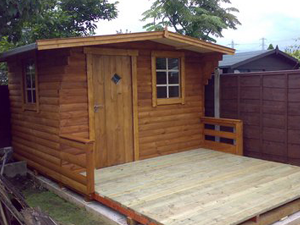 This can be constructed using either timber decking or composite decking depending on your taste and budget. This is a range we have designed ourselves and as such you will not find anything similar in the same price bracket elsewhere. 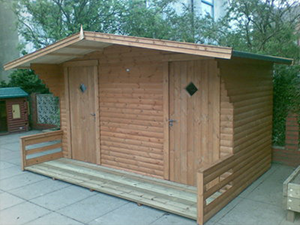 Please feel free to call in to discuss your specific requirements so that we are able to design exactly the kind of building you are looking for to enhance your garden. Robustly constructed using our 2″ x 2″ nominal planed framing. Clad with our 25mm thick (nominal) loglap boards. 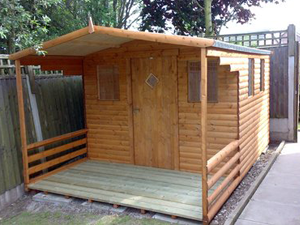 The standard treatment on our Freedman Chalet is the teak, but it is also available in our Premium Treatments. Please also ask about the range of Royal Exterior finishes we offer.